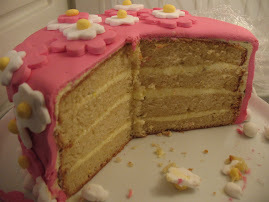 I made my first fondant cake for Easter this year, 2009. I have had no formal training but have learned through watching YouTube demonstrations, reading and practice. This wonderful hobby is a combination of several other pastimes - sewing, jewellery making, baking and craftwork that I have been obsessed with over the years. I know that I have much to learn and hopefully, one day, can turn this hobby into my full time job. Fingers crossed.